Amazing students building next-level business plans. VANCOUVER, BC - The regional winners of Summit Leaders' national case competition, this student team from Vancouver developed a business plan for a platform to streamline and improve the education experience for students. 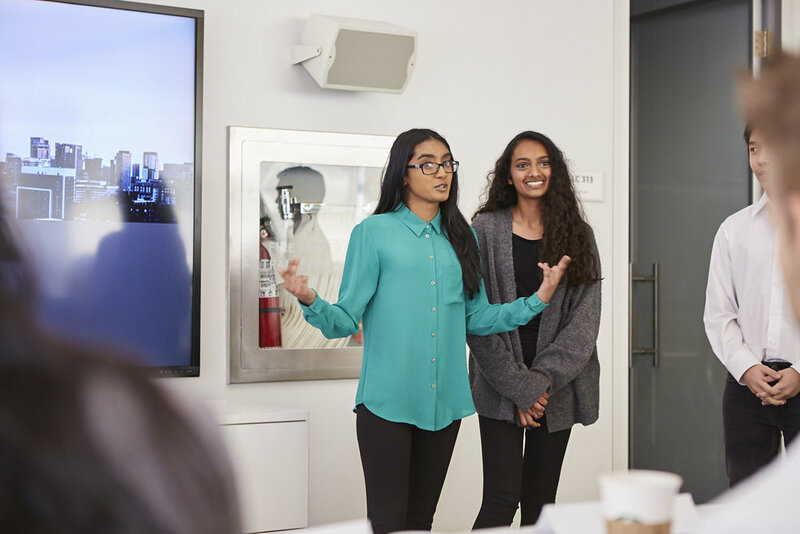 The team proposed a business case for an integrated platform that connects students, teachers, parents and school administrators on communications, curriculum, grades, connectivity and updates. In addition to competing in the national finals, the team was invited by one of the judges, a Vancouver School Board trustee, to present the idea to the Board committee and pitch to 2-3 other schools. We are excited to continue to provide updates on the development of the team's idea! VANCOUVER, BC - The second place finishers and audience favorite for Summit Leaders' 2018 Vancouver Regional Finals, team Hygeia developed a food safety rating service for restaurants and other commercial establishments. Using food safety inspection results from Vancouver Coastal Health inspectors, the team developed a weighting system to provide granular information for consumers on safe places to eat. The team is made up of a number of amazing programmers who have already developed an API prototype that can talk to Google/ Yelp based restaurant review sites.Can't wait to see what the team comes up with next! CALGARY, AB - The winners of Summit Leaders' regional finals in Calgary, Hello Closet developed a business plan for an AI-powered smart closet that acts as a pocket personal stylist and fashion expert that can be personalized to each individual's needs and preferences. The team developed a business case centered around a pressing consumer need, and created a commercialization plan and go-to-market strategy. We can't wait to see how the team continues to develop this business idea! TORONTO, ON - The winners of Summit Leaders' 2018 Toronto Regional Finals, 6ix United developed an amazing business plan for a portable bottle with both heating and cooling capabilities. The team impressed the judges with their thoughtful market analysis, and unique approach. The team was selected to compete in the Summit Leaders national competition, and was invited to interview for Sandbox at DMZ's Basecamp program. TORONTO, ON - With their idea for a mobile application that connects amateur sports players and allows them to create leagues and schedule pick-up games, team PickUp was chosen as one of the top two business plan pitches by the judges at the 2018 Toronto Regional Finals. With well thought through financial and go-to-market plans, as well as an ancillary sales strategy, PickUp will be vying for a spot in this year's Basecamp program!